The debate over the true author of the Shakespeare canon has raged for centuries. Astonishingly little evidence supports the traditional belief that Will Shakespeare, the actor and businessman from Stratford-upon-Avon, was the author. Legendary figures such as Mark Twain, Walt Whitman and Sigmund Freud have all expressed grave doubts that an uneducated man who apparently owned no books and never l… eft England wrote plays and poems that consistently reflect a learned and well-traveled insider's perspective on royal courts and the ancient feudal nobility. Recent scholarship has turned to Edward de Vere, 17th Earl of Oxford-an Elizabethan court playwright known to have written in secret and who had ample means, motive and opportunity to in fact have assumed the "e;Shakespeare"e; disguise. 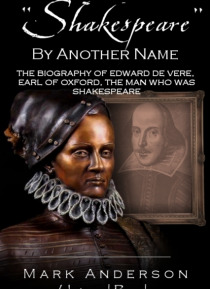 "e;Shakespeare"e; by Another Name is the literary biography of Edward de Vere as "e;Shakespeare. "e; This groundbreaking book tells the story of de Vere's action-packed life-as Renaissance man, spendthrift, courtier, wit, student, scoundrel, patron, military adventurer, and, above all, prolific ghostwriter-finding in it the background material for all of The Bard's works. Biographer Mark Anderson incorporates a wealth of new evidence, including de Vere's personal copy of the Bible (in which de Vere underlines scores of passages that are also prominent Shakespearean biblical references).